This week we have been joined by Greg who is connected to Mission Builders, a YWAM ministry based in Montana, USA. With many years experience in project management and a good understanding of the unique realities of a YWAM environment, Greg is a very insightful guy to help us process through our goals and overall direction. This is something we have come back to multiple times, since it's always good to revise previous plans and ask the tough questions to help us check if we are on track. Similarly, when new staff members join - as Evelien did in February - some group dialogue is needed to ensure we all share the same priorities and sense of direction; that we all know why we do what we do, the way we do it. Now half-way through this planning process we are identifying aspects of our vision that require a different approach to the one we have had. 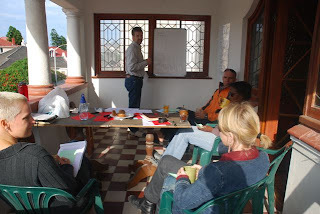 Our staff members from Africa have been reminding us again of the importance of creating a sense of family across YWAM ministries in the continent and we have discussed how a truly personal approach is needed to build a strong sense of belonging. As communicators we can get carried away with high tech solutions, while it is perhaps the most 'basic' technology that is the most appropriate. Is it time to think of putting the laptop aside for a moment and hand-writing personal letters to the leaders?! I agree that it is the simplest technology that gets the job done which is best. Even from a support standpoint, the simpler the tech, the less stress in troubleshooting! Anyways, I think this is the first time I've seen this blog. Have you guys heard of Planet YWAM? Its a nifty little site that syndicates various YWAM related blogs from around the web. I'm sure that if you email the maintainer of the site, he would love to add your blog to the list.